To help keep pace with its rapid expansion into new businesses and industries, which stretch well beyond its traditional product lines, Mickey Truck Bodies is also stepping up its acquisition of new and unique talent throughout the company. Steve Shea is one of the new employees filling a new position – Mickey Way Facilitator. In this role, he’s working with each team to identify waste and develop permanent corrective actions. His scope includes process optimization, tooling and quality issues, rework, and “any other area that causes interruptions.” He is working closely with Mickey’s manufacturing supervisors, lead men and plant employees. Shea has a Bachelor of Science degree in Mechanical Engineering from Virginia Tech (’85), and nearly 30 years of manufacturing experience in the automotive industry, including jobs with Siemens Automotive (15 years) and Stoneridge Corporation (10 years). Craig Rogers also joined Mickey recently in another new position – Logistics Manager, responsible for managing all material movement between and into the various manufacturing facilities. He’s working with Mickey’s yard, warehouse and plant employees. Rogers joined Mickey from Vitacost.com in Lexington, NC, where for the past 2 years he served as Operations Manager responsible for warehouse inventory logistics for over 45,000 SKUs. Before that he spent 9 years with UPS as an Operations Supervisor in Greensboro, NC. Rogers holds a Bachelors degree in Psychology from the University of North Carolina – Greensboro, and an MBA from the University of Phoenix. 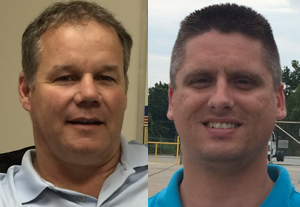 Both Shea and Rogers report to Matt Sink, Manufacturing Manager. The Quality Control team has also made a couple of moves to keep pace with Mickey’s business growth. 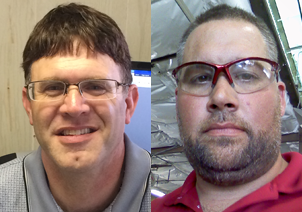 Todd Koontz, a 14-year Mickey veteran, has been appointed to the new position of Standard Operating Procedures (SOP) Coordinator; and Jason Burton has joined the company as Quality Control Inspector for the EV and MEV lines. They both report to Tim Hullett, QC Manager. “Todd brings a lot of experience and product knowledge to our team, and we are excited that he’s joining us,” says Hullett. Koontz, who is now writing all SOPs for the company, started at Mickey in 2000 as a Draftsman on the Van team and later moved to the EV team, also as a Draftsman. Over the past 2 years he’s been working with the Van team producing drawing packages for manufacturing, sales drawings for customers, and body layouts for manufacturing. Koontz has a degree in General Occupation Technology (drafting). Burton is a Certified MIG and TIG welder with 17 years of experience, including 10 as a supervisor. He has a degree in Machining Technology.